We offer dog training classes at six sessions during the year: Jan-Feb, Mar-Apr, May-June, July-Aug, Sept-Oct, and Nov-Dec. Junior Puppy class is offered every month. The upcoming class schedule is posted two weeks before the start of the next session, generally on the 17th. Most classes are limited to 8 dogs, so we encourage you to register early. Please do not just show up at a class and expect to get in. All but our drop-in classes (noted in the class descriptions) require pre-registration. You do not need to be a member to take our classes. We accept all breeds of dogs and mixed breeds too. All classes except Junior Puppy may be repeated. We are in the process of building our own training center in East Wenatchee that will be completed in 2019. Until then, we are scheduling classes at 2 different locations. Some of our classes are held in a heated indoor building at the Appleatchee Riders facility at 1130 Circle Street, other classes are held in a covered but unheated horse arena at Metcalf Ranch, 1293 Lower Sunnyslope Road. Check the schedule! Questions? Review the FAQs here. If you do not find an answer to your question, send an email to WKC.classes@charter.net or leave a message at 509-886-DOGS (886-3647). An early bird discount is available for Club members only. A member's registration must be received by the 27th of the month preceding the start of the new class session in order to receive the discount. Following are the classes that we offer. Some classes are offered every session, others are provided seasonally. IDEAL PET CLASSES: Junior Puppy, Senior Puppy, and Basic Obedience. DOG SPORTS CLASSES: Competitive Novice Obedience, Rally Obedience Novice and Advanced, Show Handling, Agility (Levels 1 through 6), Agility Premier Handling Skills, Tracking, Scent Work, Barn Hunt, Urban Tracking, Trick Dog. OTHER CLASSES: Therapy Dog Training, Beyond the Backyard, Training Through Distractions. Pre-registration is required for all classes except Show Handling, which is a drop-in class. All classes except Junior Puppy can be repeated. Use the buttons below to view and download a copy of the current class schedule and to register for a class. For puppies that are 12-20 weeks old by the first day of class. The class covers basic commands and addresses common behavior problems. Through this class, you will understand your puppy better and learn how to communicate with him/her more effectively. Puppies must have had at least 2 of their 3 puppy shots before starting class. For puppies that are 5 to 11 months old. This fun class will introduce puppy-level exercises leading up to Agility, Rally, Obedience, Conformation, Canine Good Citizen, and the important skills for an all-around confident and well behaved pet! Open to puppies 5 to 11 months old. In this class, you will learn how to have your dog heel, sit, lie down, stay in place, and come when called. These five skills are the basis of good manners and for taking fun dog sports classes like Agility, Rally, and Competition Obedience. You will also learn how to “read” your dog. This class is not for dogs who display aggression toward people or other dogs.You will have the opportunity to take the Canine Good Citizen (CGC) test in class. Click here to learn more about Canine Good Citizen. Open to dogs 6 months and older. If your dog knows “sit” and “down” and can walk politely on a slack leash, you are probably ready to Rally! Rally Obedience is a great introduction to dog sports as well as a fun pursuit on its own. Even if you have no interest in competing, you and your dog will have a fun activity once a week while improving your dog’s responsiveness at the same time. Click here for more information. Basic Obedience or permission of the instructor. In the Rally Advanced class, your dog will learn to work off-leash. As a team, you will learn the more advanced Rally skills and exercises that are part of Rally competitions, preparing you to work toward a Rally title (Novice, Advanced, Excellent). In competition, the dog and handler proceed at their own pace through a course of 10 to 20 designated stations. At each station, there is a sign providing instructions regarding the next skill that is to be performed. Click here for more information. Rally Obedience – Novice or permission of the instructor. Is your dog calm and well mannered on leash around other dogs and distractions? Can your dog sit and lie down on command? Competition Obedience prepares you and your dog to compete at Obedience Trials. Click here for more information. This class will get you started on the way to the AKC’s Beginner Novice and Companion Dog titles. In this drop-in class, you will learn how to show your dog in breed competition at dog shows. You and your dog will learn skills such as “baiting” and “stacking,” and you will get practice in moving your dog in the standard ring patterns at precisely the right speed to make your dog look his or her best. No pre-registration required. Bring proof of vaccinations for your dog. In this class, you will teach your dog to follow the scent trail left behind where a person has walked. Beginner dogs get the idea very quickly (after all, they use their noses all the time!) and the activity is fun for both dogs and handlers. This class is held outdoors in the Wenatchee area, and you will be given the location and driving directions once you have registered. Click here for more information on Tracking and Tracking Tests. This class will prepare you and your dog to earn AKC Tracking titles. In this class, your dog will learn to focus on you in a distracting environment while practicing sit, down, stay, and recall to both your left and right sides. You will teach your dog a “release word” as a command to go to a target location. Your dog will learn how to do some basic agility obstacles, such as the tunnel, jumps, and a low A-frame, and also become comfortable with wobble boards, jump bumps, and the Agility table. You will learn how to effectively use rewards like food and toys. This class may be repeated as needed. 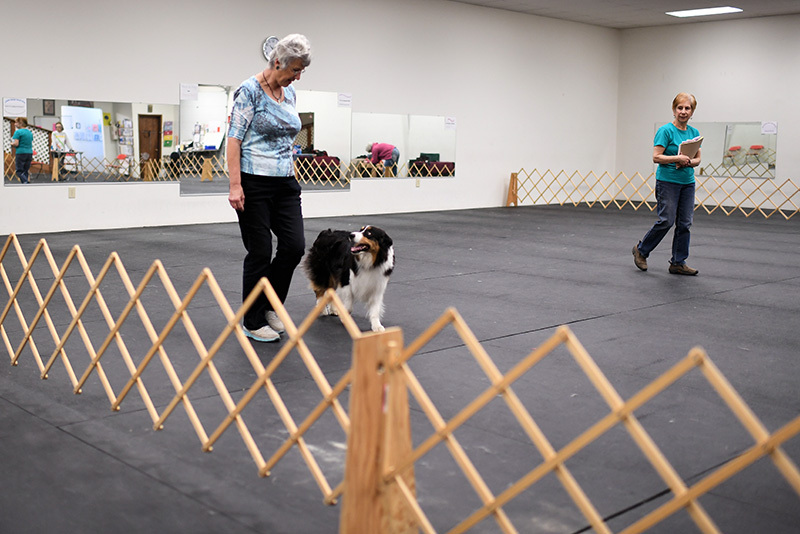 We strongly recommend that you and your dog complete a Basic Obedience or Senior Puppy class, or acquire a Canine Good Citizen title before entering Agility. Click here for more information about Agility. Your dog must not display aggression toward people or dogs. He or she should readily obey your commands to sit, lie down, stay, and come. Dog may be younger than one year. Your dog will learn to work off-leash around other dogs and on both sides of you. You will train your dog to wait, recall, “get it,” and wait in front of equipment while you "lead out." Your dog will learn to do more Agility obstacles including curved tunnels, jumps, tire jump, low A-frame, low dog walk and the teeter with a minimal drop. You will work on short, simple sequences. This class may be repeated as needed. Successful completion of Agility 1 or permission from the instructor. Dog may be younger than one year. The dog/handler team will learn positional, physical, verbal cues for pivot turns and front and rear crosses. You and your dog will practice short sequences with half-height jumps, teeter with 13-inch drop, table, mid-height dog walk, and A-frame, plus contact zone behavior. Your dog will begin to learn to do weave poles and develop contact zone behavior. This class may be repeated as needed. Successful completion of Agility 2 or permission from the instructor. Dog must be at least one year old. Your dog will learn appropriate contact behavior on the A-frame, dog walk, and teeter. You will guide your dog through full height jumps, A-frame, dog walk, and teeter, and also learn to do double, triple, and broad jumps. You will work with your dog to independently accomplish the tire jump, U-shaped tunnels, and table. Your dog will learn to do six weave poles independently from both sides. This class may be repeated as needed. Successful completion of Agility 3 or permission from the instructor. Dog must be at least one year old. In this class, you will learn correct timing and position for front crosses, rear crosses, serpentines, pin wheels, 180s, and 270s. Your dog will work on reliable contact zone behaviors, doing 12 weave poles, and entering weave poles from all angles with speed. You will guide your dog through more complex obstacle sequences, in preparation for Novice competition. This class may be repeated. Dog must be able to do all obstacles independently, including six weave poles from both sides. Handler must be able to send dog to jumps, tunnel, and table from five feet away. This class is for dog-handler teams that are already competing in Open or Excellent. You will work on timing, course knowledge, planning, consistent handling cues, multiple side changes, handling from a distance, contact proofing, obstacle discrimination, overcoming distractions, and increasing speed. This class may be repeated. Dog must be able to do 12 weave poles. Learn options to solve the handling challenges you will be presented in Premier Agility courses. This 4-week course wil be offered off-site, near Cashmere, WA, so you'll have plenty of room to use your distance skills and to use various handling options. Dog must be eligible to compete at AKC Excellent or Master's level in both Jumps with Weaves and Standard Agility. If you and your dog have already completed a Tracking Class series, you could start getting ready for an Urban Tracking title. You will help your dog learn to follow a human scent trail through an urban environment that will include cross tracks, distractions, buildings and surface changes. Class will meet twice for about 2 hours each time, depending on class size. You will be notified of class location (outdoors) prior to the class date. Based on American Kennel Club Scent Work, this class will teach you and your dog the basic skills that lead to your team's participation in the sport of Canine Scent Work. This session will emphasize search and identification skills without introducing test odors. Dogs will be on-leash, preferably about 10 feet in length. Dog must wear a harness or flat collar that will not impede the dog's breathing or stride. No prior training or skills are required. Handler must be able to keep dog under control at all times. If possible, dogs will be crated when not working. This class will continue the skills training begun in the Foundation Skills class and lead towards successful Canine Scent Work certification. Dogs will begin to learn scent identification skills. Dog must wear a harness or flat collar that will not impede the dog's breathing or stride. If possible, dogs will be crated when not working. Successful completon of Foundation Skills for Canine Scent Work or instructor permission. Therapy Dogs and their owners work together as a team to improve the lives of other people. Typical places where Therapy Dogs and their handlers go are schools, assisted living centers, and hospitals. Bear in mind that Therapy dogs are not service dogs. Service dogs are specially trained to perform specific tasks to help a person who has a disability, such as a seeing-eye dog who accompanies a blind person. Therapy Dog training is being offered as a multiple-week class to prepare you and your dog for the test to obtain the AKC Therapy Dog title.